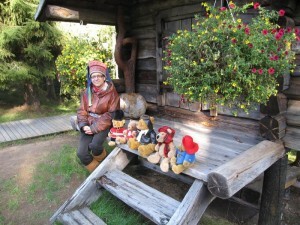 Does your teddy bear need a holiday? “Send your best-loved Teddy Bear or soft toy on an unforgettable trip. Santa Claus will personally wish him/her welcome to Rovaniemi and the Arctic Circle. Your beloved soft toy will meet Santa in his grand house in the Santa Claus Village at the Arctic Circle in Finnish Lapland. He/she will also cross the Arctic Circle and be awarded a certificate in honour of such. The unforgettable and unique lifetime experience trip includes a wide variety of different programmes. Your little friend will become familiarised with Rovaniemi and its fascinating surroundings with programmes led by a professional guide. Finnish firm Teddy Tours Lapland Oy (www.teddytourslapland.com) has come up with one solution: holidays in northern Finland for that special stuffed friend costing from 110 euros to 170 euros ($140-$216). The “Standard Journey” for teddies includes a trip around the northern town of Rovaniemi and is capped off with a visit to Santa Claus. The stuffed animal will also receive a gift, send a postcard to its owner and be sent home with holiday photos. The “Luxury Journey” includes, on top of the standard journey package, a trip to a reindeer farm where the bear can feed Santa’s reindeer. “This is followed by a snowmobile safari. On safari, Teddy will try ice fishing on the frozen waterway and savor hot chocolate by the campfire,” the firm said on its Web site, adding the whole trip will also be recorded on videotape. Teddy Tours Lapland will also provide the bear, should you not want to send your own abroad or don’t own one yet. This entry was written by Chaos, posted on May 23, 2010 at 10:37 pm, filed under Random and tagged cuddly friend, northern finland, teddy bear. Bookmark the permalink. Follow any comments here with the RSS feed for this post. Post a comment or leave a trackback: Trackback URL. I am thinking about offering the same service for teddy bears… Who wouldn’t like to enjoy the beach? Or see Mardi Gras?? And it would work great if the teddy bear is made out of real hair!